What a difference a year makes. It has been nearly one year since Roger Federer ended his 2016 campaign following a semi-final defeat at Wimbledon to Milos Raonic in five sets. One year since the Swiss hung up his racquet in order to continue to rehab his knee following surgery. As all eyes once again turn to the All England Club for the Wimbledon Championships, Federer is back and ready to retake his throne. Fresh and fit, the 35 year old says the right preparation is essential to success. How does the seven-time champion get ready for his 19th consecutive appearance at SW19? "Today, for instance, I was just trying to have good energy in practice," Federer told the assembled media on Saturday. "Short and sweet, just get it done. Tomorrow I'll be off. Then sort of basically resting, just making sure I come in fresh into that first round with the right mindset. "I don't want to be at the mercy of my opponent. I want to take charge and play aggressive myself. So for that I need to be fast on my feet and quick in my mind. I just need enough rest so I can play enough inspired tennis. "In practice itself, I'm just trying to play forward, serve-and-volleying some. Making sure I don't get stuck behind the baseline and just making shots. It's more being really proactive in practice right now." Federer is bidding for his eighth Wimbledon crown, which would make him the all-time title leader at the All England Club. He is currently tied with Pete Sampras and William Renshaw with seven singles trophies. He would also join Rafael Nadal as the only players to win at least eight titles at a single Grand Slam tournament, with Nadal also achieving the feat at Roland Garros. The Spaniard holds the record with 10 titles after completing 'La Decima' last month. Federer knows that he'll have his work cut out to lift the trophy again this year. With Nadal in top form after dominating the clay-court season, Djokovic on the heels of a title in Eastbourne and Murray the defending champion, it won't be a routine task. "Depending how fit he is, if he's anything close to 100 per cent physically, I consider Andy one of the big favourites to win the tournament," Federer added. "It's that simple. It's the same for Novak and the same for Rafa. "I think it's very even when we put it all out on the line. Everybody has their own little story right now. I feel like Andy's one of the best players in the first week at Wimbledon, so I don't worry too much for him there. He can play himself into shape hopefully for week two. "Novak is just coming back from winning Eastbourne now. Rafa is coming in red hot from the clay. So I see it positive for them rather than negative in some shape. But I see that they are going to be tough to beat here." Lleyton Hewitt was the last man other than Federer, Nadal, Djokovic and Murray to win Wimbledon, back in 2002. 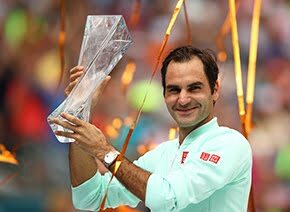 There appears little chance of that changing this year and Federer, bidding to win his 19th Grand Slam title, agrees that the big four are still head and shoulders above the rest. "I do believe there are other favourites. I include the likes of Cilic into that, Stan, guys who have done it before. Zverev and Kyrgios have shown what they can do, how good they can be. The likes of Raonic and Nishikori and Dimitrov I think are in a good spot right now where they can go very deep and nobody would really be surprised," he said. Federer is riding a wave of momentum into his 70th Grand Slam main draw appearance, having streaked to the title at the Gerry Weber Open without dropping a set. 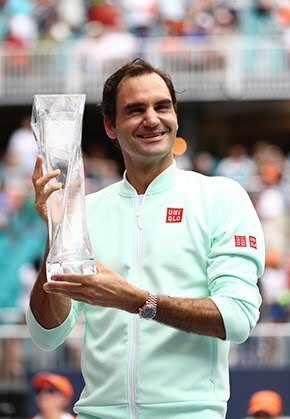 He has a 24-2 win-loss mark in 2017, also including victories at the ATP World Tour Masters 1000 events in Indian Wells and Miami, as well as his 18th major title at the Australian Open. He will open with a tough test against the unpredictable Alexandr Dolgopolov. Federer has not dropped a set in three encounters, with their most recent meeting coming at the 2016 Australian Open. A potential second round date with young talent Stefanos Tsitsipas awaits, with Raonic, Alexander Zverev, Grigor Dimitrov and John Isner also looming in his quarter of the draw.